May 7, 2017, 12:30pm. Buy tickets here. At the Saban Theater, 8440 Wilshire Blvd. Beverly Hills, CA 90211. Ticket: $35 each; a copy of Our Revolution included with each ticket. No exceptions. Senator Bernie Sanders changed the conversation in the 2016 presidential race. Neither Hillary Clinton nor Donald Trump could avoid the sheer power or public appeal of his message; his campaign quickly shot from an underfunded peripheral effort to the mainstream stage. Bernie’s Revolution went to Main Street and nearly took it over. This event does not include a book signing. All tickets include a copy of Our Revolution, and a limited and randomly selected number of ticket purchasers will receive a signed copy. These are copies of the book with bookplates signed by the Senator. We are not able to accommodate any requests for signed books. We are unable to ship any books before or after the event. Seating is general admission only. Tickets are limited to four (4) per order and are will call only. Doors open at 11:30am. Please bring your ID to pick up your tickets at will call. Please leave large bags, large purses, and personal items at home. Large bags and purses will not be permitted. Various independent parking lots are available surrounding the theater. Parking generally ranges from $5-$15 (subject to change). Most side streets surrounding the theatre are restricted to permit parking. Please give yourself enough time to find parking and enter the theater. When Bernie Sanders began his race for the presidency, it was considered by the political establishment and the media to be a fringe campaign, something not to be taken seriously. After all, he was just an Independent senator from a small state with little name recognition. His campaign had no money, no political organization, and it was taking on the entire Democratic Party establishment. 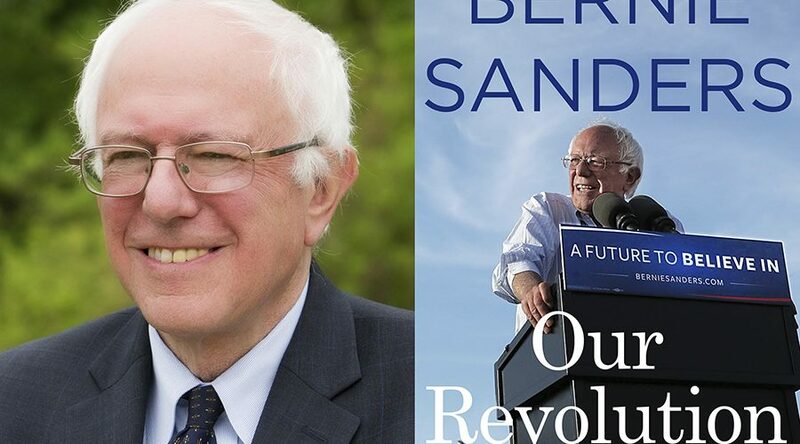 In Our Revolution, Sanders shares his personal experiences from the campaign trail, recounting the details of his historic primary fight and the people who made it possible. And for the millions looking to continue the political revolution, he outlines a progressive economic, environmental, racial, and social justice agenda that will create jobs, raise wages, protect the environment, and provide health care for all–and ultimately transform our country and our world for the better. For him, the political revolution has just started. The campaign may be over, but the struggle goes on. Bernie Sanders ran as a Democratic candidate for President of the United States in 2015 and 2016. He served as mayor of Burlington, Vermont’s largest city, for eight years before defeating an incumbent Republican to be the sole congressperson for the state in the U.S. House of Representatives in 1991. He was elected to the Senate in 2007 and is now in his second term, making him the longest-serving independent in the history of the Congress. He lives in Burlington, Vermont, with his wife, Jane, and has four children and seven grandchildren. Writers Bloc thanks KPFK for their support. This entry was posted in Author, Books, Books, Books, Past Events, Politics, Program. Bookmark the permalink.